The Bear Course at the Okanagan Golf Club is one of two spectacular golf courses at this 36 hole golf resort in Kelowna. 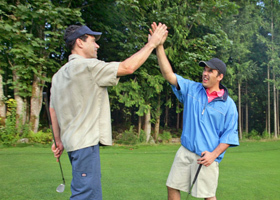 Planned by Nicklaus Design to ignite your passion for the game, The Bear's 18 hole 6,885 yard, part 72 masterpiece design opened for play in 1999 and is unlike any other golf course in British Columbia. With dramatic sculpted fairways surrounded by the forests and sage brush hills of B.C. 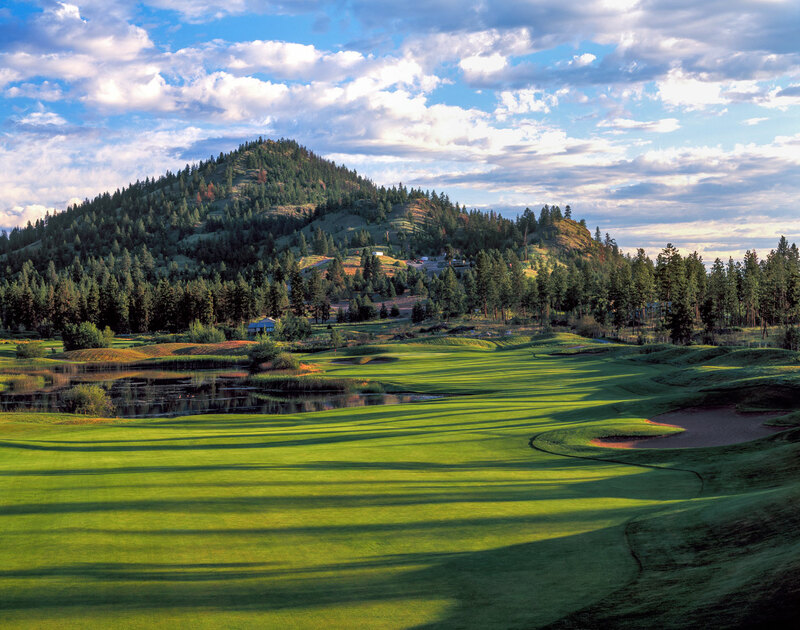 's sun-drenched southern interior, The Bear is the crown jewel course of the Okanagan Valley. Crafted by Nicklaus Designs, one of the pre-eminent golf architecture firms in the world, The Okanagan's Bear Course can prove as ferocious as a grizzly or as gentle as a teddy, depending on which set of tees you choose. On its hind legs the layout stretches to 6,885 yards. Well-placed bunkers, grassy swales and collection areas, sculpted moundings, and tiered greens lend the course some challenge. The routing climbs through forested hills on a plateau overlooking the Okanagan Valley. The Bear's signature hole comes at number three, 453 yards of challenge requiring a combination of accuracy and distance to avoid two bunkers en route to the green. While the course boasts an extensive collection of sweet holes, numbers thirteen through fifteen - playing over the blue waters of Lake McIvor - are the real honeys here. More than 150,000 cubic metres of earth were moved to create the lake and the dramatic topography around it, yet the course maintains a perfect harmony with the natural terrain. Tee it high and let if fly on this beautiful par 5. Avoid the water on your second shot and you will be left with a short approach to a two-tiered green.